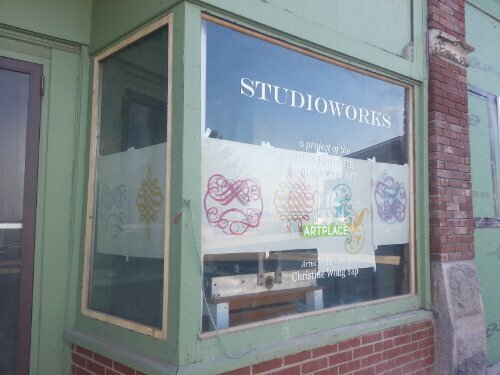 Proofs in the printshop windows. I'm too shy and easily distracted to print with focus on the etching press nested in the storefront. 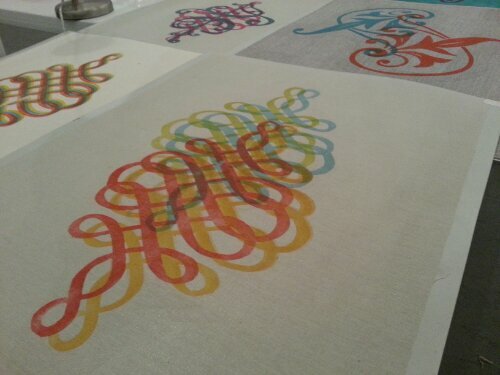 New woodcut prints on linen and cotton, to be sewn into banners. I’ve been cranking away in the print shop for the past 2.5 weeks in this Studio Works residency at the Tides Institute and Museum of Art. It’s been great reaching far back into my memory and bringing my old woodcut and letterpress knowledge into the present. Luckily, traditional printmaking techniques are antiquated, so they are pretty much the same as when I last printed (only less toxic, due to solvent alternatives and less showy bravado on my part). Still, there is always room for invention. For example, its fun to embellish upon established registration methods to suit your needs. 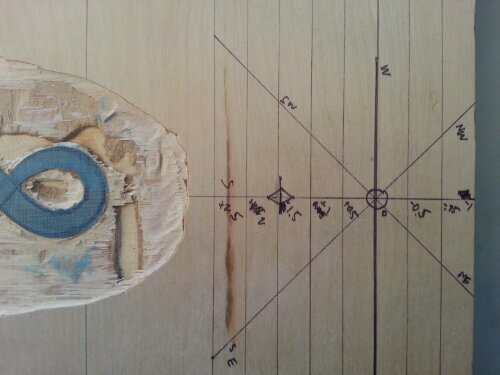 I’ve taken a basic centerline and overlaid axes, with each direction labeled N, S, E, or W.
Annotated print-in-progress. It doesn't look like much but you'd be surprised how many prints I made before I realized how much a few notes would help. 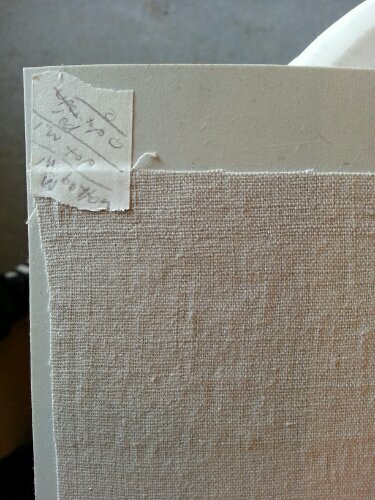 I’ve annotated each print with the direction and offset distance of each pass (i.e., S 0.25″). Then if I want to do a series of passes on a 45 degree angle, my notes will remind me how far I’ve gone, and what the next pass should be (i.e., SW 1″, SW 0.5″, 0, NE 0.5″, etc.). 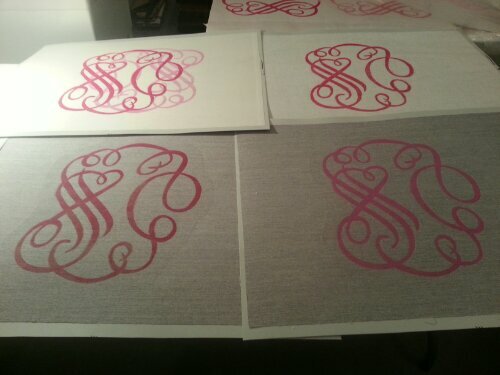 Woodcut prints on fabric adhered to plastic backing sheets for printing and registration. I’m really pleased with the materials I got for mounting fabric during printing. I’ve only printed on fabric once or twice before this, and I knew I needed to keep the fabric rigid for registration across multiple passes. At the old CCA printshop, which included stone lithography equipment, there were plastic tympans to use instead of blankets between your plate or block and the press drum. Eastport is small enough that I knew I had to order my materials in advance, so I got HDPE sheets–they’re flexible, durable, easy to cut with scissors, and, most importantly, chemical resistant. I also knew from screen printing that I’d need spray adhesive. Low tack repositionable spray adhesive behaves just like it sounds, and so far has left no residue. Together, these two things have made printing on fabric a breeze. I spray a light mist of adhesive on the plastic sheet, lay down my cut fabric, smooth it out like vinyl, and it stays perfectly in position through multiple passes through the press. Instead of laying my printing substrate down on the block and then turning the press handle, I’ve found another method to print cleaner: register only the front end of the tympan, then push the bed forward so the drum grabs, then release that hand to crank. Keep the back end high throughout, so the fabric only makes contact to the block when both are under the drum. 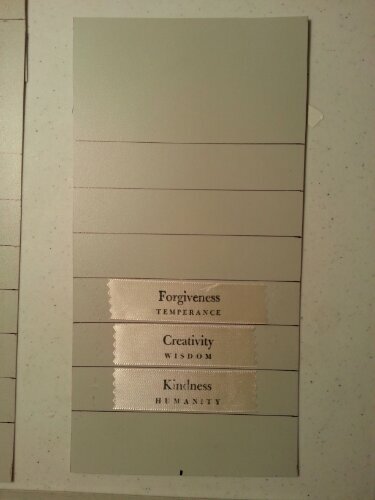 Labels for character strengths semaphore flags. Lead type printed on ribbon. The same materials, though smaller in scale and manifold, has been working out really well for printing lead type on ribbon to make labels on a proofing press.